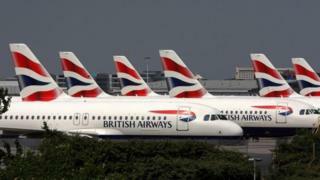 Airline group IAG, which owns British Airways and Iberia, has reported record first-quarter profits. IAG, which also owns Aer Lingus, said underlying operating profits in the quarter rose 10% to 170m euros (£144m). The increase came despite a 2.8% dip in group revenues to 4.9bn euros. IAG added that bookings for its new long-haul low-cost airline called Level, which starts services in June, were "well ahead of expectations". Level will operate flights from Barcelona to Los Angeles, San Francisco, Punta Cana and Buenos Aires. Chief executive Willie Walsh said: "This is a record performance in the first quarter, traditionally our weakest quarter, with the improving trend in passenger unit revenue continuing." IAG said it expected operating profits for the year as a whole to show an improvement from 2016. Shares in IAG were up 5% in afternoon trading. Easyjet shares rose 3.5% after the no-frills airline reported strong passenger growth in April. The airline carried 7.11 million passengers last month, 11.7% more than a year earlier, although numbers were boosted by the Easter break falling in April this year. Neil Wilson, from ETX Capital, said the figures were impressive: "Some nice figures from two of the key players in the UK airline sector this morning suggest that the turbulent times of late are being left behind. "IAG has been able to navigate its way through stormy conditions last year, posting a 31% rise in annual profits in February so this is continuing the trend and means it's on track to live up to expectations that this year will be even better than last." Can long-haul air travel also be low cost?